New York surfers risk almost anything just so they don’t hear those famous words, “You should have been here an hour ago.” Discover what it takes to brave the cold Atlantic Ocean and get a fresh insight on the Big Apple’s hidden surf subculture. Adventurous photographer Andreea Waters has developed relationships with local surfers, absorbed scarcely available knowledge about the ocean and climate, and placed herself in these elements without reservation. To respect the locals and their underground culture, there is no mention of where the specific action takes place. Locations may include Rockaway, Montauk, Long Beach, Lido Beach, and Northern New Jersey. The book includes insight from George Bates, Paul Schmidt, Jeff Anthony, Michael Reinhardt, Michael Kololyan, Evelyn O’Doherty, Tony Farmer, Sean Kittle, Giuseppe Giammona, Siobhan Mullen, Juliane Camposano, Ashley Wood, Russ Dungan and Derek Hynd with a forward by Tyler Breuer. Review Fix: What inspired the book? Andreea Waters: After shooting for a few of years I looked at my work and saw it in a book. I feel that surf photography belongs in ink. It has beauty and soul. A book becomes part of a home, you can hold it in your hand and engage in conversation. It has a story, every time you flip the pages you can discover something new. It celebrates a period in time that will never happen again. Review Fix: What did you learn that you didn’t expect? Waters: So much. Before I took my first surf lesson someone on the boardwalk said to me, “You have to try surfing, it will change your life.” I looked at him and said, “Ha. That’s what they all say.” And so I did. My first wave, that feeling..I knew that I will do it again, and again, and again. I learned the power of the ocean, how it gives you that high, magic feeling and spit you out and break you. Also, when you choose to live by the tides, the ocean is home but it can also destroy your world. I started photographing in spring of 2012 and documented the Hurricane Sandy destruction. Passion and a streak of selfishness are in the bones of a New York surfer. You have to really want it to make it all happen. On the East Coast you can’t plan your surf. The waves are inconsistent, the city is a traffic disaster, the best waves are in the winter and it is cold. Rockaway Beach is the only surfing beach that you can access by Subway, a long ride on the A-Train. When waves are on, life goes on hold. Photographing surfing is a mix of art, wave science and technical detail. The light and waves change constantly, you have to react to what happens. Each surfer has a style, you have to anticipate their ride. You have to pay attention to the way the waves break and position yourself. You have to learn about swell and wind direction, forecasts, weather patterns. It’s complex, an addiction and a feeling. Review Fix: Who was your most interesting source? Waters: So many people touched my journey in different ways. I have to say, the most interesting conversations and learnings have been with George Bates. George is a surfer and artist, I worked with him on the hand lettered type and design for the cover of the book. I met him in the fall of 2012. He grew up surfing New Jersey and Rockaway Beach, he was one of the surfers who chased waves before the Forecasting Apps came into play. One of things he’d tell you, “Growing up surfing pre-internet you always went to surf whenever it rained or was stormy as this was the only way to guarantee any decent size.” He is part of the culture then and now. He taught me surf break politics and the ways of the ocean. He mixes his surf passion with his art which I can relate to and admire. Even when not surfing, on a good day he will check the cams and give me some wave wisdom for different breaks and swell behavior. 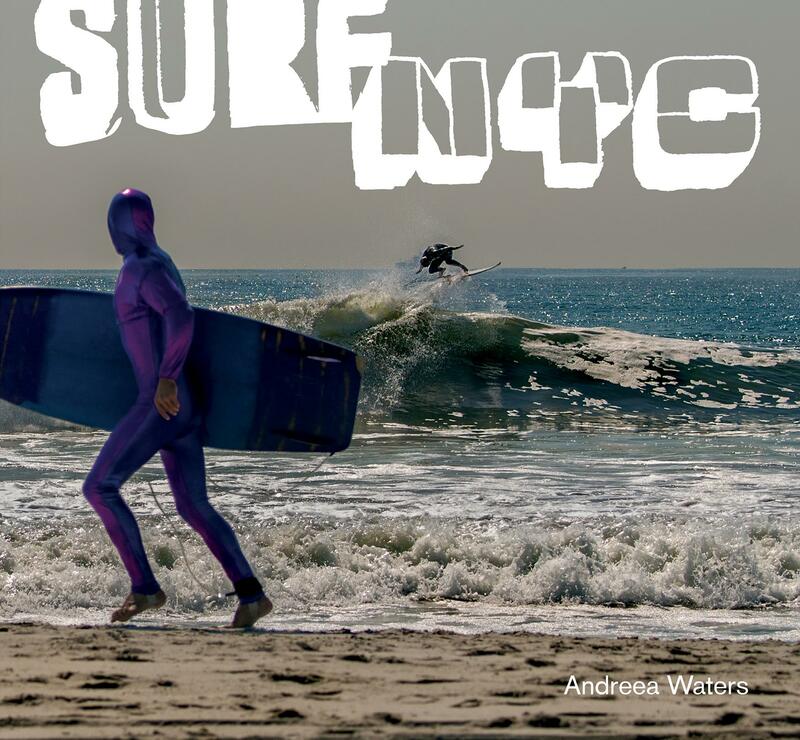 Waters: Surf NYC is a celebration of ocean community and New York surfer soul. It is a glimpse into what it feels like to surf here and a showcase of moody Atlantic Ocean. The beauty in the madness. Surf NYC is a love letter for a haunting daydream. Waters: Dig deeper and keep photographing. Share the highs and reality of the surfing life. Maybe a more intimate book on the history and present of New York surfing. Explore other urban surf cultures. Stay salty.